It started as pain in his right leg, just below knee upon running the mile at school in his 8th grade year. We all thought it was just shin splints or growing pains, since he was running and growing. There was no visible sign at first, but in a few months, a small liquid bump formed at the site of the pain. On December 10, 2003, we took him in for an x-ray and it showed “something like a mass” and then over the next two weeks, an MRI, biopsy and diagnosis: osteosarcoma (bone cancer). Our world fell apart and we regrouped to battle with our new foe: cancer. Our doctors told us what Ian would have to do: a protocol of chemotherapy for a couple of months, then surgery to remove the tumor, to be followed with more chemotherapy for another three to four months. We should be done in a year. It seemed so daunting. But what choice did we have? Ian had a central line placed in his chest and chemo began. Chemo is nasty stuff and Ian did not do well. He was nauseous, vomited a lot and lost weight. One of the effects of chemo is neutropenia, a lowered while blood cell count, which reduces the body’s ability to fight infection. Ian would become neutropenic after most treatments and endured numerous staph infections that were treated with IV antibiotics. So it went… chemo, neutropenia, blood or platelet transfusions, more chemo and so on. So much for school, Boy Scouts (he’s now two badges away from Eagle Scout), music lessons, skiing and backpacking. They would have to wait. Three months later, Ian had limb-salvage surgery to remove the tumor and now has a metal implant knee and tibia. Ian finished chemo in February 2005, almost six months longer than it should have taken due to all the infections. 2005 was a year of celebration and getting back to normal. The highlight was his Make-A-Wish trip to Lake Powell on a houseboat that summer. He finished 8th grade in the spring and entered Mira Costa High School in the fall. Scans taken every three months were clear, but in March 2006, the enemy was back. A thoroscopic surgery was done in his left lung and it was confirmed as osteosarcoma. Scans taken in June showed more tumors. We consulted with a specialist in New York for a second opinion. A more aggressive chemo protocol was prescribed and done. Another lung surgery was done in October 2006 to remove his upper left lobe. His December 2006 and March 2007 scans showed more tumor activity and we were getting worried. Chemo did not seem to be working to get rid of this cancer and our options were dwindling. A friend and business associate of ours showed us an article on Rexin-G awhile back and I brought into his oncologist to see what he thought. Dr. Gordon and our oncologist discussed it, and to make a very long story short, Ian has been approved for a single compassionate use of Rexin-G. We are so grateful to Dr. Gordon and her staff for agreeing to treat Ian. Rexin-G gives us hope for our Ian and hopefully for others suffering from many types of cancers. 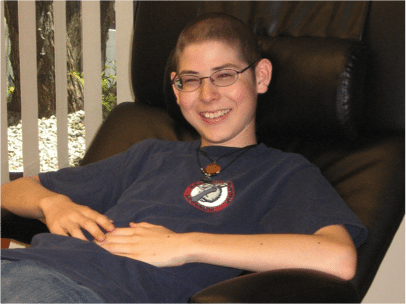 On January 25, 2008, Dana Dornsife was privileged to give the following eulogy at Ian’s funeral mass, celebrating his life, courage and accomplishments. Nine months ago, Lazarex Cancer Foundation was introduced to the White family through mutual friends, Mike and Sandy Doell. The Whites were in need of help to defray the costs associated with Ian participating in the Rexin-G clinical trial. Lazarex Cancer Foundation was honored and grateful to have the resources to be able to come to their aid. Over the past nine months I have come to realize that it was actually Ian who was aiding our foundation. We had good intentions, but Ian opened our eyes to the realities of family life with cancer. Today, I believe we are a stronger organization for having known him. I have been in Ian’s presence only three times. The first time, I was in awe of his courage, strength and composure. I had contacted Ian’s mom, Karen, about having Ian as a guest speaker at our first fundraising event, “Celebrating Hope.” Karen and Ian agreed immediately; however, Karen was hesitant because the gala was two months away and she wasn’t sure if Ian would still be with us. Two weeks prior to the gala, she joyfully called us and announced that they would attend and Ian would in fact be speaking to the audience. When the Whites arrived, I knew Ian was in pain as I watched him navigate the room with his cane. When it came time for Ian to speak, he left his cane behind and walked directly to the microphone. With a huge smile on his face, Ian addressed the audience of several hundred people and told his story in a way that only he could. He was honest, humble and sincere and even threw in a few laughs. Ian mesmerized the audience and when he finished, he received a standing ovation. During his talk, he mentioned that one of his goals was to achieve the rank of Eagle Scout through the Boy Scouts of America. The second time I was in Ian’s presence was at his Eagle Scout ceremony, again with hundreds of people who gave him a standing ovation. Another proud moment for his Mom and Dad, another opportunity for me to marvel at his courage, strength, accomplishments and spirit, and the challenges that he faced. The third time was on Christmas Eve day at Dr. Chawla’s clinic in Santa Monica where he was being treated with Rexin-G. My husband, Dave, and I were fortunate to have some quiet, one-on-one time with Ian, and afterward we flew home reflecting on how much Ian had accomplished in his short life and again admired his courage and strength. It occurs to me that there is a recurring theme here: courage and strength. Ian didn’t know the meaning of the word quit. He made the most of life and what it had to offer him. Even with Ian’s parting, he continues to help us. Lazarex Cancer Foundation is borrowing a page out of Ian’s book. He will always be our inspiration, he will always give us the strength and courage we need to fulfill our goals, and in his honor, we will not quit. We will change the face of cancer one life at a time and make cancer a disease of the past.